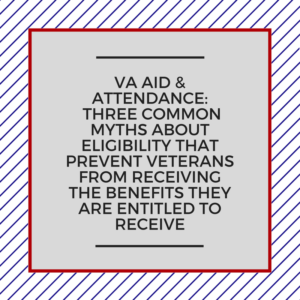 VA Aid & Attendance: Three Common Myths About Eligibility That Prevent Veterans From Receiving The Benefits They Are Entitled To Receive. Veteran Pension (VA Aid & Attendance) is unfortunately only used by about 3% of the eligible veterans. However, we’ll look at 3 of the common myths that discourage people from applying for this well earned benefit. There are benefits for service related disabilities. But the “Pension” benefits are for NON-service related disabilities, including simply be 65 years old or older. 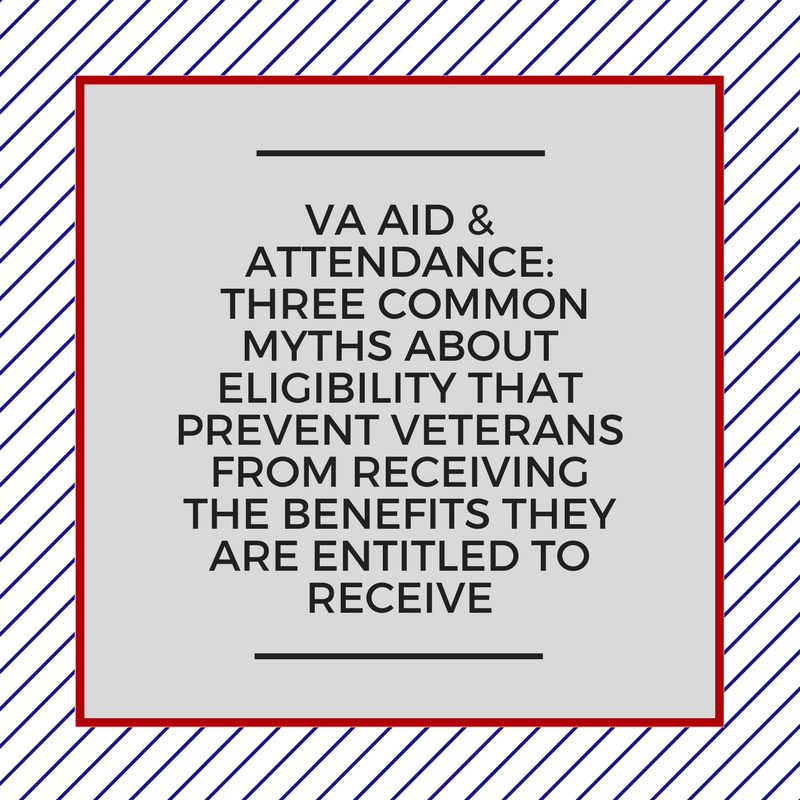 If you are “homebound” or need what is known as ” VA aid & attendance” to help you with daily living activities, then your benefits will likely increase. This money can make a huge difference in the quality of life for a veteran and can help relieve the financial strain on the family. The word “Pension” can fool us into thinking this is for “retirees” of the military. That is not true at all. You may have only served a short time in the military and left when you were in your early twenties. It doesn’t matter as there is no requirement to retire from the military. The purpose is to help war time veterans (and their surviving spouses) who need help from a non service related injury or disability. Sometimes the benefit is known as being for “War-time veterans” which is true but somewhat misleading. You do have to have been on active duty for at least one day during a war time as defined by the VA. Normally we are talking about World War II, Korean War, Vietnam War, and the Gulf War. But this does not mean you had to be in a combat zone. You can be active duty and be stationed here in the US or at a military base in an allied country (Germany during Viet Nam war, etc). Those who faced “hostile fire” deserve our admiration. However, this is not a requirement to be considered a “war-time veteran” for purposes of this important benefit. These three myths are not true and prevent many veterans (and their families) from having the options and freedom to live their lives where (at home for example) and how (independently) that they choose. Rather than assuming the myths you read about or have heard about are true, we suggest you find out (at no charge) what your options are. You can find a lot of information on our website here or you can contact us…. Or you fill out our contact form and we will be glad to chat with you.